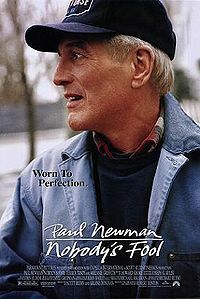 Nobody's Fool is a 1994 comedy-drama film based on the 1993 novel of the same name by Richard Russo. It stars Paul Newman, Jessica Tandy, Bruce Willis, Melanie Griffith, Dylan Walsh, Pruitt Taylor Vince, Gene Saks, Josef Sommer, Philip Seymour Hoffman and Philip Bosco. The movie was adapted and directed by Robert Benton from the novel by Russo. It was nominated for Academy Awards for Best Actor in a Leading Role (Paul Newman) and Best Writing, Screenplay Based on Material from Another Medium. It was one of Jessica Tandy's final films. The movie was filmed in the Upstate New York locations of Beacon, Fishkill, Poughkeepsie, and Hudson. The setting for both the book and movie, the upstate New York village of North Bath, is based on the village of Ballston Spa, in Saratoga County.